YouthBuild Philly gives each student the unique supports and opportunities needed to change their future. Your support makes it possible for young people in Philadelphia to realize their full potential. Make a gift to the Annual Fund today. 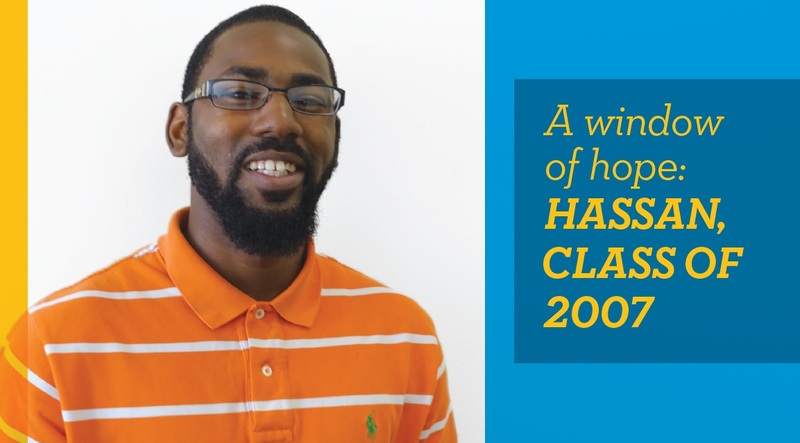 When Hassan came to YouthBuild Philly in 2006, he had already attended several high schools, but had dropped out or been kicked out of each one because of his temper and impulse to fight. He was anxious about trying to go back to school after repeated disappointments, so he enrolled at YouthBuild at the same time as his sister to ease the transition. What Hassan discovered, though, was that he already had “family” at YouthBuild, in the form of case managers and vocational instructors who were eager to support him as he worked to overcome his old mindset. Hassan enrolled in the selective Certified Nursing Assistant training track, and gained confidence and professional skills while interning at Mercy Hospital and volunteering at a Red Cross senior center. Thanks to his valuable on-the-job training, Hassan found a job within two weeks of graduation and has excelled in his career thanks to the professional and communication skills he learned at YouthBuild. He is now a senior CNA at Shriner’s Hospital for Children in North Philadelphia and is the self-described “go-to guy” for his department due to not only his professional experience, but also his experience as a parent. He has a knack for “dealing with kids on a kid’s level,” he says, but plans to go back to school and eventually open his own home security business. “The sky’s the limit,” he says of his future. YouthBuild Philly continues to “rise above” others that service the community by educating our youth and transition them to be productive members of society. YouthBuild, please continue to do what you do and do so well. Kudos to Youthbuild and all the staff, “It really does take a village to raise a child”. Thank you for your words of support!